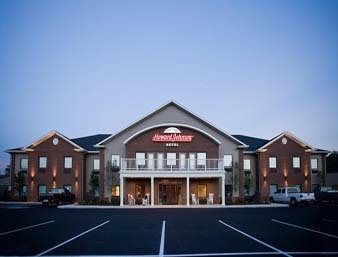 Location/ Directions: Take I-40 W toward Nashville , then take the US-27 exit 347 toward Harriman.The Howard Johnson is on Hwy 27 on the left just after the 2nd light. About Hotel: Building built in 2007. 2-Floors, -Rooms, Interior Corridors, Business Center, Free High Speed Internet, Free Breakfast, Gym/Fitness Center, Truck/Bus Parking, Full Service Restaurant On-Site, Large Movie Theater, Guest Laundromat, 24 Hour Front Desk, Wake-Up Call Service, Ice and Vending Machines, Free Local Calls, Free Parking, Free Newspaper, Cribs Available - No Charge, Roll-away Available (fee), Non Smoking Property, Coffee Maker, Hair Dryer, AM/FM Clock Radio, Iron and Ironing Board, LCD Flat Screen TVs and DVD Players, Mini-Fridge and Microwave, Over Sized Guest Rooms, Expanded Cable With Over 70 Channels, No Pets Allowed. Railroad View: Excellent View! Any room on the front of the hotel will give you a clear, perfect railroad view. You will hear the train horns as trains blow for the crossings in town. Railroads past Hotel: Norfolk Southern Railway. 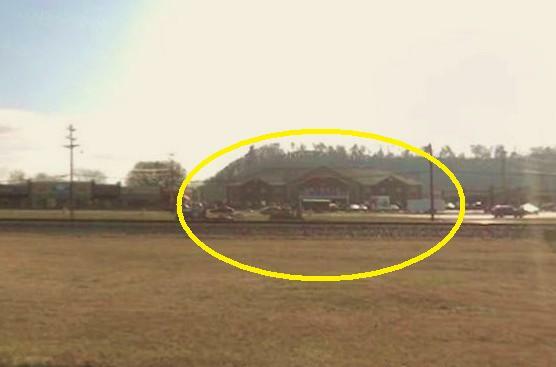 Photo Comment: The Google Street photo to the right shows the Howard Johnson Hotel circled in yellow. You can see the single track railroad in the foreground. About 2 blocks north of the hotel is the old restored train station, now used by the Spring City Chamber of Commerce. Next to the train station is a bay window caboose on display as well as a gazebo, which maybe an ideal place to be while waiting for the next train to pass. I am uncertain of the train frequency on this route.